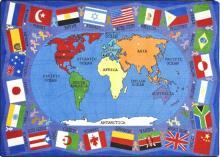 Travel around the world on the Kids Play Mats! Your young students have advanced beyond reciting the alphabet and counting to ten. They are ready to tackle more complex subjects, such as the countries of the world. We have designed the perfect teaching tool that will help your students learn about each continent and phonetically sound many countries of the world. Our design includes a map of the world in the middle of the Kids Play Mats, with the most popular countries forming a border around the rectangular design. You choose from three sizes to accommodate your classroom size. If learning was all there is to the Kids Play Mats, you could just buy a globe and teach your class about geography. We construct these mats with SoftFlex®, which is an air-texturized, polypropylene, secondary back that is the latest advancement in area rug backing systems. The tightly woven fibers provide extra comfort and eliminate the wrinkles that appear after rambunctious children play on the mats. Our antimicrobial treatment prevents mold and mildew from building on the Kids Play Mats. This contributes to the mats exceeding stringent indoor air quality standards. You can rest assured that your students will not inhale dangerous mat fibers or ink dye fumes.